In 2018, Montana farmers planted roughly 6,000 percent more hemp acreage than they did in 2017. The people behind the surge are using different methods than hemp farmers in other states, and generally don’t have the same experiences as your typical hemp cultivators. As harvest season arrives, however, success for these new hemp farmers is far from guaranteed. “The more I read and learn about hemp, the more impressed I am with the plant. You can turn it into so many different things,” says Colby Johnson, a fourth generation Montana farmer. 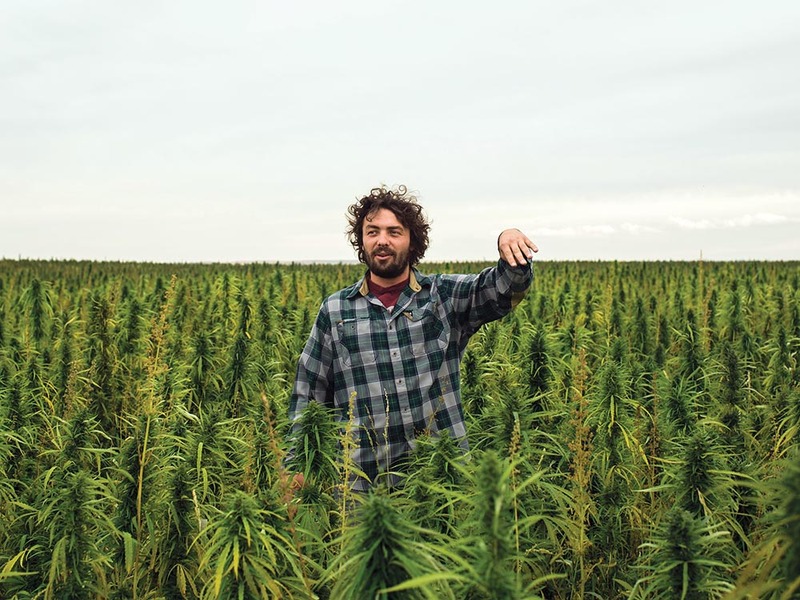 He’s standing in a field with multiple hemp varieties that stretches well beyond the horizon and what the eye can take in, holding a flower from one of his plants. The Johnson family plants and harvests around 20,000 acres of crops on their farm near Conrad, Montana, about 50 miles from the Canadian border. They grow malt barley, winter and spring wheat, dirham, green peas, yellow peas, lentils, garbanzo beans, soy beans, corn, canola, alfalfa, and sainfoin — and now hemp. As he surveys his first harvest this year, Johnson brims with excitement. “It’s amazing. We grow wheat too, so compare it to a wheat seed. When I put a wheat seed in the ground, at harvest, we can turn it into what: flour for bread, beer, maybe a couple of other things? But hemp, you put one little seed in the ground […] I could stand here for the next week and list the things you can use hemp for. Johnson’s forest of hemp grew above 13 feet tall, on his farm outside Conrad, Montana. Johnson is part of an emerging trend. This year, Montana farmers are planting hemp in acreage that far exceeds what they’ve done before. And it’s largely being done using methods associated with traditional agriculture, in places that few visitors to the state have ever seen. At the extreme north end of the 3,100-mile-long Continental Divide Trail, where most hikers end their arduous journeys, sits the Crown of the Continent, Glacier National Park. With its sublimely turquoise, glacially-fed rivers, abundant wildlife, and majestic peaks, it draws over three million tourists each year. For many visitors that come to Montana, Glacier and Yellowstone National Parks — and the communities that immediately surround them — are the one small snippet of the state they’ll ever see. While the postcard-perfect peaks and wild rivers are very much a part of the real Montana, between and around them you’ll find valleys and plains filled with family farms and ranches. If you travel east from Glacier, past the long shadows of the park and the craggy peaks of the Front Range, you encounter a different Montana altogether. Here, in land not so long ago inhabited by the Blackfoot Tribe, whose reservation sits about 25 miles to the west, you encounter what’s known as the Golden Triangle, named for its rich soil and ideal agricultural conditions. Tourism may be what draws most visitors to the state, but in most of Montana, agriculture is king. The edge of the Front Range marks the boundary between the Bob Marshall Complex’s 1.5 million acres of designated wilderness and the vast Montana prairieland. For the past few years, the hemp industry has been booming in states that have a historical connection to the plant or an established, legal cannabis industry. But in Montana, which has neither, it’s been slow to take. That is, until now. That’s likely because Montana is a relatively conservative state where hemp is still strongly associated with marijuana. Generally speaking, the communities of the state that rely most heavily on agriculture for their economies are among the state’s most conservative. So while small pockets of hemp production popped up around the state, many farmers remained wary of growing a crop that, until very recently, was associated with illicit drug use. But with Republican legislators now increasingly backing hemp as an agricultural commodity, attitudes are evolving. While Montana may have been slow to ramp up production of hemp, in 2018, they’ve turned that trend on its head. Justin Loch is the membership director of the Montana Farmers Union, an ag advocacy organization based in Great Falls, Montana, that works to support family farms. With over 1,600 paying members in Montana (the Montana Farmers Union is part of the National Farmers Union, which has over 200,000 members), the organization is one of the largest farming-focused organizations in the United States. In early 2018, Loch traveled the state providing educational workshops about industrial hemp, where he was met with large crowds. Johnson, who traveled to some of the workshops to help educate other farmers, reiterates Loch’s sentiment. “Whether it’s wheat prices, or barley, or whatever, prices are generally sh*t right now. Farmers need a crop that they can grow and make money on. And right now, I think that’s hemp,” says Johnson. Last year in Montana, the state’s hemp pilot program only allowed producers to plant 50 acres. In 2017, Johnson, his father Paul, and his brother Ross each planted 50 acres of industrial hemp for hemp hearts. This year, they’ve combined their efforts to seed 350 acres of multiple strains of hemp, hoping to sell it most of it for CBD extraction instead. An agronomist on their farm recently estimated a plant density of 110,000 plants per acre, meaning they’re sitting on roughly 38,500,000 hemp plants. The Johnsons are not alone in their expansion. In 2017, Montana had 14 hemp producers with a combined 425 acres, says Ian Foley, who works for Montana’s Commodity Services Bureau and heads its Industrial Hemp Pilot Program. Much of that hemp was grown for foodstuffs, likely a product of Montana’s (and its pilot program’s) proximity and agricultural ties to Canada, where hemp is primarily grown for food. A pivot line sits over a massive plot of multiple hemp varietals, which were planted using a seeder. They’ll be harvested using traditional farming methods for commodity crops. If you paused when you read that number — 25,000 acres — you’re probably not alone. But it’s not a typo. In 2017, the entire nation planted 25,713 acres of hemp per Vote Hemp’s 2017 U.S. Hemp Crop Report. In other words, when Montana farmers decided to try out hemp, they went big. But while the present state of Montana’s hemp industry is thriving in terms of interest, education, and acreage, the situation isn’t perfect. The surplus of hemp grown this year in Montana illustrates a collection of problems echoed across the hemp industry writ large, particularly when it comes to processing bottlenecks and seed sourcing issues. Loch’s statement reiterates the confusion surrounding the acquisition of approved seed varietals, not just in Montana, but around the country. For farmers, it means performing due diligence and contacting their state’s pilot program for clarification are the safest way to ensure compliance and move forward. One block off of Main St. in Conrad, Montana sit bins and elevators, the calling cards of communities surrounded by productive farmland. Johnson says that most of the plants on his farm, which are the Canadian ruderalis variety, are currently testing at about 3 percent CBD, which is far below the percentage of many of the nation’s smaller scale hemp farms that grow specifically for CBD. But with the large amount of acreage that Montana farmers are planting, and the fact that many of them use seeders, pivot lines, and harvesters to grow and harvest their crops (minimizing the number of people and hours required to produce the crop), it’s possible that the lower percentage will be counterbalanced by the sheer amount of product grown. Planting, growing, and harvesting hemp for CBD in this manner hasn’t really been tested yet —meaning the overall outcome is still unknown. For instance, if the crops produced by Montana farmers generally have a low percentage of CBD, what will it mean at processing? Will it be economically viable to extract? And if some of the traditional agriculturists use pesticides and insecticides on their hemp fields, which seems likely, will these compounds become super concentrated during extraction? That processor in Eureka is Vitality Natural Health, which sits in the state’s extreme northwest corner near the Idaho and Canada borders. Speaking with HEMP, multiple people familiar with the Montana hemp industry expressed concerns about the company’s ability to process the amount of acreage planted this year, as well as its relationships with farmers. Johnson says that originally when they planted this year’s crop, they considered sending it to Eureka. One of the buds on Johnson’s farm. Now, Johnson says, he’s in talks to bring another processor to Conrad, which he estimates would provide around 15 much-needed jobs to the 2,600-person town. But that processor won’t be up and running for 2018’s harvest season. HEMP reached out to Vitality Natural Health multiple times and received no response. Loch is hoping that, at the end of the day, farmers won’t be stuck with harvested crops they can’t sell. UNCERTAIN? YES. BLEAK? MAYBE NOT. Johnson, for his part, acknowledges the uncertainty about who and how his hemp will be processed, but doesn’t seem overly concerned. It’s a quintessentially Montanan attitude in a state where rugged individualism is very much a societal undertone. And it’s also a sentiment that hits to the heart of Montana’s hemp industry: While in other states it appears that the industry is being by led by people who have learned to cultivate their plants with expertise garnered via the medical cannabis industry, in Montana, the growth is being spurred by traditional agriculturists — farmers much more at home at a county rodeo than in a cannabis dispensary. It’s likely that these farmers will have to learn the intricacies of the plant from growers who cut their teeth in the medical cannabis industry. But it’s also likely that people who have been growing crops, working with processors, and getting product to market for decades will have just as much to teach the emergent industry. Despite uncertainty about seed varieties and processors, hope for the hemp industry abounds in Montana, just as it does elsewhere in the U.S.
Surveying his recently harvested wheat fields that sit adjacent to the steep bluffs and meandering, arterial canyons of Marias River Breaks, Johnson waves his hand in a wide swath across the horizon.